What makes a Maui Thanksgiving? Well, for most people, not much is different from any other Thanksgiving feast in the country. I know I’ll be waking up early tomorrow to roast my turkey and get the green bean casserole in the oven, before settling down to watch the Macy’s Parade—on a tape delay, of course! Since my Thanksgiving traditions are based on what my family on the mainland does (including sauerkraut with the turkey! ), I asked the Temptation Tours reservations staff what the traditions were for their families, who’ve been on Maui for many, many generations. When I asked what was on their tables this year, both Clarice and Carmela reported that their Thanksgiving dinners are pretty much the same as mine, except swap out my sauerkraut with their white rice! However, when it comes to the turkey, both of them have some very Maui-esque plans for the big bird: an imu! No, not an emu–an imu, a traditional fire pit where meat is slow-cooked with hot stones, and smoked to absolute fall-apart perfection. If you’ve been to a luau, you may have seen a pig being unearthed from an imu, before devouring the salty, smoky, juicy goodness along with all the other traditional Hawaiian delights. Turkey cooked in an imu is just as good as pork, and is a local tradition. The night before Thanksgiving, the whole family (or even more than one family) will gather with their turkeys (or hams), and put them in the imu for a long, slow cook. Prized kiawe wood gives the turkey a unique, smoky flavor, and fresh taro or banana leaves bring some moisture to the party, giving it a good steaming in addition to the smoke. The whole thing is then covered with wet burlap, and then buried in the ground again. After burying the turkeys, most families have a pre-Thanksgiving party, and enjoy drinks, pupus, and games, before turning in for the night. The next morning, the imu is uncovered, and the turkeys are ready to shred, kalua-style, and gobble up! While I will be roasting my bird tomorrow, I will have to ask my coworkers nicely for some leftovers of their imu-cooked turkeys this year. 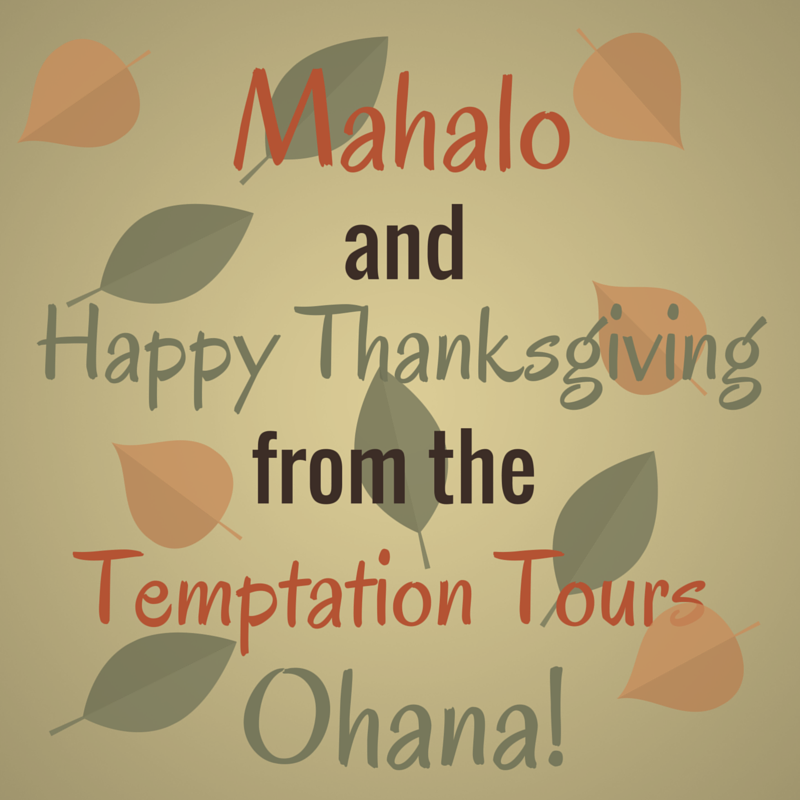 I know we’re all thankful that Temptation Tours has been a part of so many guests’ vacations this year, and that our whole company is taking the day off to spend with our families. We can’t wait to start the busy holiday season, and share more of the best of Maui with your family soon! Whether you’re short on time, or just don’t have the budget for more than one tour, it can be hard to make a decision sometimes. Do you want to see the lush rainforest of East Maui on the world-famous Road to Hana? Or would you rather spend time at Maui’s most-visited attraction, the dormant volcano of Haleakala? 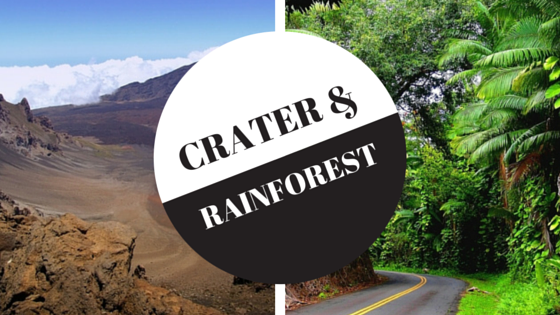 If you can’t decide, you might consider our Crater & Rainforest tour, where you’ll get the best of both worlds, all in one exciting day. Many of our Hawaii-Certified Tour Guides cite the Crater & Rainforest as their favorite tour, since they get the chance to show guests the vast ecological diversity found on our island. Like our other land tours, the Crater & Rainforest tour begins at your hotel, resort, condo, harbor, or residence, usually around 7:00 AM. With a group of six to eight discerning guests aboard one of our Luxury Limo-Vans, you’ll begin your day with the journey to the Summit of Haleakala. You’ll have a chance to get to know your fellow travelers and Tour Guide while enjoying a morning snack of cake and coffee, tea, or cocoa. Your Tour Guide will point out the major points of interest at this incredible feature, a shield volcano that takes up the majority of the island. A stop at the Visitors’ Center is also on the agenda, giving you an opportunity to find the perfect souvenir from this very special place. After your visit to Haleakala, your tour descends back down its slopes, into “Upcountry” Maui. You’ll see the towns of Kula and Makawao, where life is just a little quieter and more laid-back than the rest of the island. While in Kula, your Tour Guide will prepare an elegant al-fresco dining experience for your group, complete with a white linen tablecloth, crystalline plates, and real flatware. Read more about your lunch experience here! You’ll also enjoy a stop in Makawao after lunch, with a bit of time to explore this historic cowboy town. Then, it’s the “Rainforest” part of the tour! You’ll experience about half of the world-famous Road to Hana, complete with those notorious hairpin turns! It’s amazing to see the stark contrast between the moon-like desert of Haleakala Crater and the lush, green, vibrant East Maui rainforest all in one day. The Crater & Rainforest tour takes you as far as Ke’anae Peninsula, where you can explore this ancient Hawaiian fishing village while taking in the incredible waves crashing against the rocky shore. Your Tour Guide will share its cultural and geographical significance with you before heading back to Central Maui, all at a “Maui-style” pace. Finally, you’ll experience an incredible photo opportunity at the famous Ho’okipa Beach Park, where you can get a glimpse of expert windsurfers riding the waves, and possibly a few green sea turtles napping on the beach. Guests have been known to snap hundreds of incredible photos here, which we absolutely love to see! The Crater & Rainforest is one of our most classic, well-loved tours, and it truly gives you a glimpse of the incredible diversity that can be found here on the Valley Isle. Being unable to make a decision might turn into one of your best decisions yet—contact us soon if this sounds like the tour for you! Of course, when you’re on Maui, you’ll be eager to sample some of the best local, Hawaiian-style cuisine, of which you’ll find plenty while you’re here! From the hole-in-the-wall treasures to the most upscale eateries, both Hawaiian and Asian cuisine rule the landscape on the island. What if you’re looking to change it up, though? 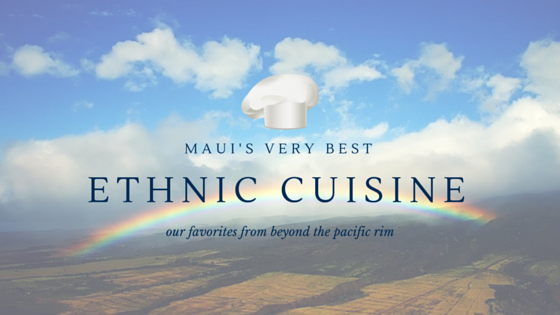 Read on for our picks of the best ethnic cuisine on the island that falls outside the Pacific Rim! Tucked away in a Kihei shopping center, you might not give this up and coming Latin eatery a second glance. That would be a pretty big mistake, though, because this place is serving up authentic, creative Mexican cuisine, along with huge margaritas and incredibly friendly service. Top picks include the langostino enchiladas, the fajitas, and the pan de elote for dessert. Also, don’t pass up one of their sweet-and-spicy margaritas that will knock your socks off—we love the roasted jalapeno version! Greek food might not even cross your mind while you’re on Maui, but in case it does, Pita Paradise most definitely has you covered. They manage to combine Mediterranean food with fresh island flavors in a brilliant way. You can seriously feast here, so arrive in Wailea with an appetite! We love the ahi tartare (or really, any fish dish—it’s caught fresh daily! ), the lamb kabobs, and, of course, the baklava ice cream cake. You gotta get their thyme lemonade too—whether you get it alcoholic or virgin, it’s amazing! This Front Street eatery is another spot that’s gaining popularity quickly, and for good reason! Their house-made, authentic Italian pasta, pizza, and more are simply top-notch. Both locals and visitors alike rave about the lasagna, crostini, and their expertly-crafted cocktails. The interior feels intimate, casual, and truly Italian. You may even forget that you’re on Maui, but that may not be a bad thing just once during your trip. Whether you choose an entrée, or just enjoy an evening of wine and cheese, you’ll have made the right decision. German? On Maui? Yep—you heard us correctly! This Swiss/German eatery is located in Kahului, and it’s absolutely fantastic. The tiny restaurant features European knick-knacks and cuckoo clocks all over its walls, and boasts a charming outdoor eating area as well. Whether you go with bratwurst, schnitzel, or one of their daily specials, you will have a filling, delicious meal, served with aloha that’s 100% Maui. My recommendation? Anything with the roesti potatoes, and of course, a tall German beer. This place is another hidden gem, located on the ground floor of the Menehune Shores condominium complex in North Kihei. Although it’s undergone some changes in ownership and in name, this place has been a solid addition to Maui’s culinary melting pot for several years. Portions here are huge, and everything is fresh-cooked and authentic. From samosas and papadums to tikka masala and biryani, they’ve got everything you might crave from an Indian restaurant, all with the most beautiful ocean view. My favorite way to chow down here is with garlic naan, saag paneer, and a mango lassi. If you’re a dessert person, go for their simple but delicious rice pudding, full of Indian spices. Of course, both Asian and Hawaiian fusion cuisines are still the most common, and are executed quite beautifully by many of the state’s best chefs. However, if you’re looking for some unexpected flavors in a tropical setting, you’ll have your pick from some truly exceptional spots. Bon appétit!